It is a tube drive effects pedal kit, a vacuum tube pre-amp pedal kit based on the 12AX7. It is to be used with a 9V adapter. 9V battery can be used too but due to the considerable current draw, the battery life will not be long. The Persuader acts as a pre-amp, as well as it can boost and add vintage, warm and smooth tube tone / overdrive to the output. Construction is very easy as it comes with a detailed instructions manual. The circuit operation is simple to understand as well. For those that followed the DIY tube amplifier articles here, it will not be hard to understand. The 12AX7 is biased in operating points so low (out of the normal settings / points) that it runs into compression, clipping, and / or distortion. The 12AX7 tube filament runs on the same 9V as well, meaning that the filament is starved too, being lower than the manufacturer specifications. Both signify that the operating current will be lower than usual. Those are reasons why it can be operated with just a 9V supply. You can do so too with other tubes if you’re building from scratch. Building the kit is easy. Just follow the manual and you will be fine. It took me a few hours to complete the kit, where I took a slow pace to get it built to avoid damaging the chassis finishing. The die cast aluminum chassis is pre-drilled, making the parts assembly a piece of cake! The components come pre-packed and labeled clearly. The manual include drawn pictures, descriptions and deciphering of all the components to make building the kit possible for non-technical enthusiasts. I think my business graduate girlfriend should be able to do it by herself too. It is recommended that the kit be built on a soft surface to prevent the nice violet paint being scratched. I love the violet finish by the way. The Persuader kit shall be built with point-to-point wiring. Diagrams are provided in the manual with step by step instructions to perform the component mounting and soldering. Builders should read and understand the manual before starting the DIY process. What you need are probably the soldering iron, solder, screwdrivers, pliers, wire cutters and a pair of steady hands. Not so steady hands are OK too, based on the simplicity of the project. Real estate is tight in the chassis and careful thought on the wiring planning are advised. A double or triple check on the wiring and soldering work are recommended too, to screen for mistakes, shorts and opens. The chassis is conductive and therefore the components should not touch the chassis. This is the completed The Persuader kit. Wiring is neat isn’t it? Thanks to the manual and also my hard work! The space at the bottom is for the 9V battery. Use a small sponge to hold the 9V battery snugly in place if needed. I’m using a DC power jack for the testing. The battery connector was wrapped and taped in plastic before the chassis is closed to prevent shorts. 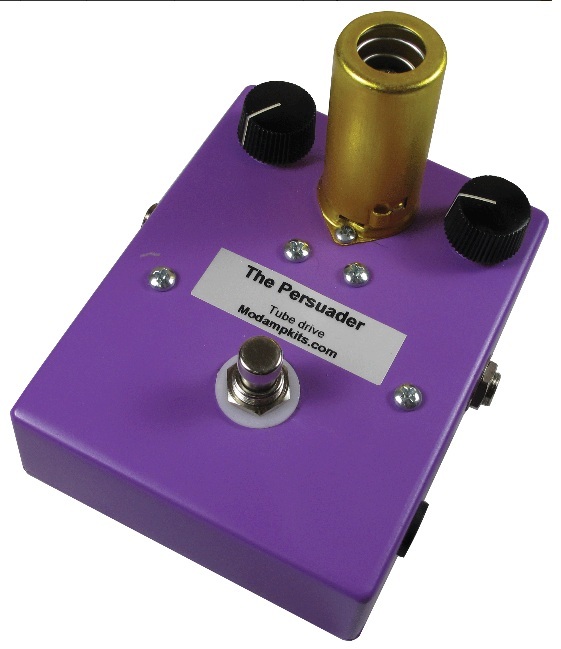 The schematic for The Persuader kit is available at MOD KITS DIY. The schematic is complete with voltage levels specified. I used that to check against the built kit with a digital multimeter to see if everything is working as per the design before connecting the guitar amplifier. After all this fun, it’s time to pass the kit to our guitarist, Adrian! I didn't need much “persuading” that this is a great add on pedal to your gear. The first A Chord I hit, The Persuader is a great must-have. The sound is smooth distortion for days. My unit was built by Ken, it's well wired, totally silent when not kicked in, and there are no traces of hum at all. What kinda sound will you get? Dial in an 8 to 9 and you'd get something like Bon Jovi's Living in Sin. Dial in a 10, you've just slipped into Angus Young territory. You get smooth, biting overdriven chugging chords. If you're a Japanese reader, think of it this way ….. Dial in 9, push up the treble, you get Yui's Rolling Star (opening for Bleach 5). Shift the sucker up to a 10; you're ready to do the Naruto ROCK, by Hound Dog. If you're someone living life, stuck in the 80s, like Moi, with the right amplification, and a Strat (which I don't have ) dial it up to 9.5, and you're up for a gig with Milo (Descendents) auditioning, Silly Girl, all over again. This pedal is a keeper, well worth your investment. I won't recommend using the product on stage. It's best for garage and practice environments. I've personally not found the courage to use valves on stage. If you want to use The Persuader on stage, here's what you can do. Pick up a kit amplification system, something like the MOD-102, put both the MOD-102 and The Persuader into a self contained chassis, ala a Marshall head, and you'll have a real best value for money amp head built, in a couple of days. Do you have the same thoughts? Share it!